This last week, I had some leftover ham after our Easter meal, so I decided to make a quiche with some of it. I hadn't made one in quite awhile, so I began looking to see if I had the right ingredients, or if I would need to go to the store first. I decided to use what cheese I had at home, which would be cheddar cheese instead of Swiss, but that sounded good to me! I didn't have a prepared crust, so I made one and prebaked it for about 10 minutes, and let it cool while preparing the rest of the filling. I used some steamed asparagus and fresh herbs also. After the crust was cool, I first sprinkled some preshredded cheddar jack into the crust,and then topped it with a cup of diced ham and some cooked asparagus cut in about 1 inch lengths. I added some sauteed onion next, and then I mixed my eggs and some half and half together really well. To the eggs, I added parsley, chives, salt and pepper, and poured it in the pan. I placed some asparagus spears on top just for decoration and popped this baby in the oven for about 50-55 minutes, as this is a large quiche. When done, let it rest for 20 minutes or so before delving into it. It was so delicious, even if it didn't have Swiss cheese. The cheddar was great with the ham and asparagus and I loved the fresh herbs in it. My husband loved it and was more than happy to eat it, which was great, as I was wondering why I had made such a large quiche? This recipe will fill a 10 inch deep dish pie pan. 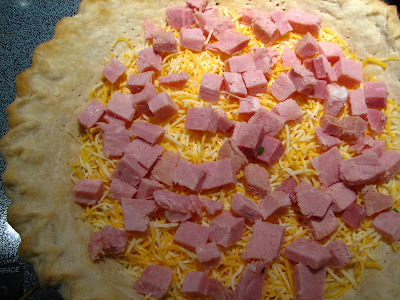 You may make your own crust or buy a premade crust from the store. So, let's make some quiche! Using a fork, prick the bottom of a 10 inch, deep dish, pie shell and then bake at 425 degrees for about 10 minutes and remove to a rack to cool. REDUCE heat to 350 degrees. 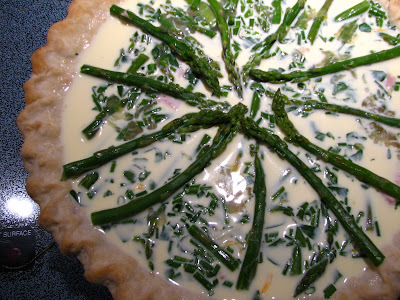 After crust has cooled, add the cheese, then the ham and onion if using, and then the asparagus. Next, mix the eggs and half and half together. Stir in the herbs and salt and pepper and pour over the asparagus. Add some asparagus spears on top, if desired. Transfer the pie to a baking sheet and place in the oven. Bake at 350 degrees for about 50-55 minutes until done. Quiche will puff up when done and when given a shake the filling will not jiggle. You can test it, if desired, by inserting a knife in the middle and it will come out clean when it's done. Cool at least 20 minutes before slicing. Enjoy! Do you like quiche? What a perfect quiche. I've never thought to add apsaragus to mine - great recipe! Looks beautiful and DELISH! I am STARVING just looking at it! This is gorgeous! I've been eating tons of asparagus lately, I can't help myself, I keep buying it :) This looks like a great way to use it. Yummy yummy! 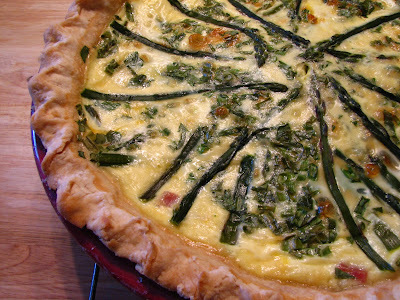 I love Asparagus Quiche, I am impressed you make your own crust, I havent mastered it yet! I love quiche, but my husband will eat it and grumble all the while as he eats it. I now just serve it for my girlfriends. This one looks great and I love asparagus. Wow what a great quiche. Super picture mouth watering. I love the spiralled asparagus on top. 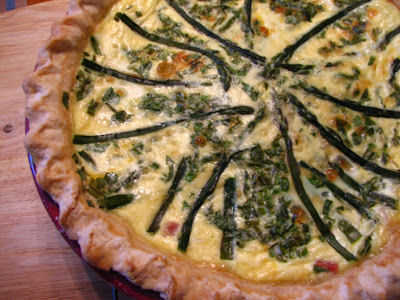 What a lovely quiche this would be for Mother's Day brunch. Thank you so much this is great I'm making a version of it tonight. I can't wait to post and link back to you! Thanks a bunch. Read through all your asparagus recipes and stored them in my head. I have some asparagus at home so I shall try the recipe with the balsamic vinegar first.